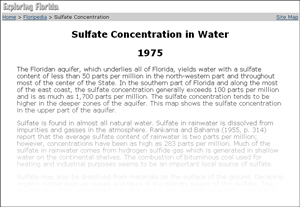 Using the resource from 1975, students will compare the suggested sulfate level to today's standards. Students can learn how to measure the minerals/chemicals/pollutants in water. Students can make a podcast (using Garage Band on a mac, Camtasia? on a PC) of a typical public service announcement (30 seconds to 1 minute). This PSA will aim to inform Florida's residents of the sulfate levels and what we can do to lower/raise them, etc.